Air pollution makes the pollen season longer and more intense resulting in increased societal costs of reduced productivity and rise in healthcare spending. Despite the fact that about 40% of the world’s population or 3 billion people suffer from hay fever, or allergic rhinitis, the problem is often neglected. 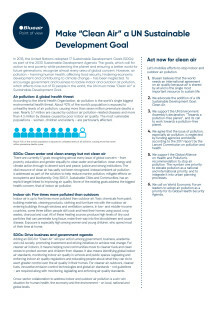 Today, at the inaugural UN Forum on Global Medical Health & Environment, Blueair, a world-leader in air purification solutions, called on the international community to add a Sustainable Development Goal on “Clean Air”.